Approved development concepts and permits in place. Why is Ambergris a Caye? 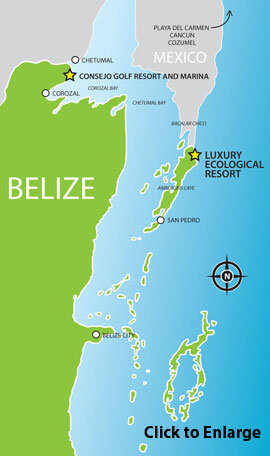 Casa Bay Inc., in conjunction with GMA International, has assembled a world-class resort development property in Belize that is available for purchase. An EIA has already been approved for the property and an ECP has been issued for final negotiation and approval. This is your opportunity to own a high-end resort property in Belize, a destination poised for explosive growth in the North American tourist market. The property presented on this web site comprises more than 1,040 acres of prime Caribbean real estate. It also has a development plan in place – but not yet finalized – that offers enormous marketing potential. The centerpiece of this offering is a 970-acre luxury golf resort community and marina featuring more than two miles of sandy coastline along the sheltered waters of Corozal Bay. This property will be home to the only world-class championship golf course in northern Belize and, due to the absence of other suitably sized properties, is expected to maintain that distinction. Complementing this development is a secluded, high-end ecological resort area on Ambergris Caye, gateway to the Belize Barrier Reef and some of the most spectacular marine adventures on the planet. The complementary nature of these properties will offer myriad opportunities for cross-marketing and strategic packaging of vacation and retirement offerings. One resort. Two distinct feels. One unique investment opportunity. Exclusive access to official land titles, documents, and full reports on the properties and their approved developments. Please note: this is NOT an offering of individual lots/units for sale. Casa Bay Inc. is an international land-holding corporation with Canadian principals operated out of St. Michael, Barbados. © 2015 Casa Bay Inc. A Barbados IBC (International Business Company). All rights reserved.